This week’s free iTunes App of the Week is called Tangent, and it allows you to transform your photos into works of art, no matter what your level of artistry is. The Tangent app provides simple tools to transform your photos into amazing works of art that can be shared and enjoyed, no matter what your level of artistry. And, once you spend a few minutes with a basic photo you will discover how very simple way to elevate any photograph into a new dimension of creative expression. 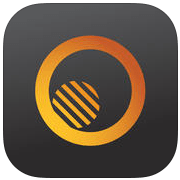 Tangent received top honors from the Apple iTunes App Store as was featured in the official iPhone 5s promo video, Apple App Store Best of 2013 and recognition as an Editors Choice. How it Works – Take a photo with your Apple iPad, iPhone or iPod Touch and then open a photo from your Camera Roll and let your groovy imagination take over. The toolbox offers an assortment of impressive frames, shapes, patterns, fills and blends, then apply. And, the easy to use interface allows you to drag, resize, rotate and zoom, add colors and adjust opacity–whatever inspires your creative juices. When you’re done, share instantly with friends or continue adding more layers by tapping “Retangent.” It’s that easy.